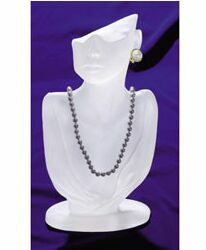 This lady stand is perfect for displaying earrings and necklaces. Made of attractive frosted acrylic. 12.5"H x 6"W x 3.5"D. Color: frosted clear.